For the seventh time, the Institute of the Regions of Europe (IRE) organized on the 27th of March 2018 a conference on sustainable mobility “Smart Cities”. In cooperation with the City of Salzburg and the Land Salzburg, the session was held in the Salzburg Congress. This conference highlighted the great challenge of sustainable mobility for all European cities, but above all for the provinces. Smart Cities are urban agglomerations, which use modern information and communication strategies, sustainable technology and socio-scientific methods in order to pave the way into a post-fossil society. A vital element for a smart urban development is therefore coordination in the areas of mobility, energy and eGovernance. In smart cities, individual mobility is predominantly public and eco-friendly. Smart urban development and transport concepts are central elements that must take into account the increasing mobility needs of the urban and rural population and at the same time its environmentally friendly effects. “In order to reduce commuter traffic and pollution, the involvement of the regions is particularly important. An environmentally friendly, sustainable planning for traffic relief and increased quality of life calls for the surrounding communities. 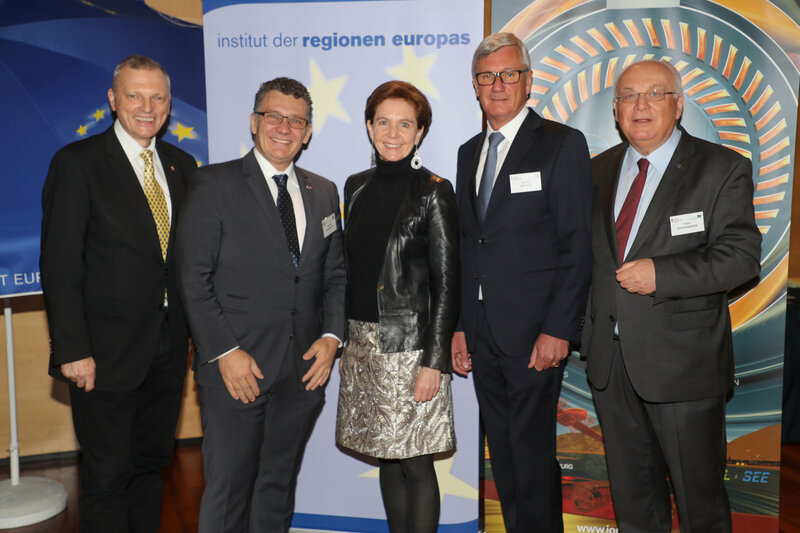 Examples from Austria, Germany, Slovenia and Switzerland show how to increase mobility can improve traffic conditions and reduce pollution”, said IRE Chairman Franz Schausberger. The former provincial governor (Landeshauptman) of Salzburg also addressed the aspects of population growth and the consequences of rural depopulation. Above all, “solutions go beyond the city into the regions, since many conditions and processes of smart cities are regionally interwoven”, explained Schausberger. Smart spatial development can thus contribute equally to securing living conditions and to sustainable metropolitan development. The Master Plan for Mobility of the Regions and Cities of Europe, which also has an impact on the citizens of Salzburg, offers particular potential. 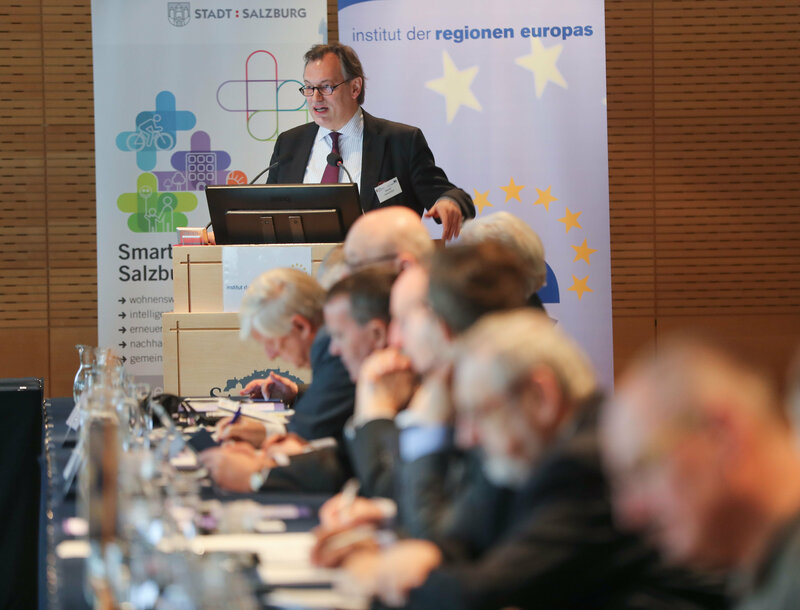 “Medium and long-term planning concepts in urban development, sustainability and the careful use of resources – the city of Salzburg has been paying close attention to these important issues of the future for decades”, emphasized Mayor Harald Preuner in his welcoming address. “The master plan 2025 ‘Smart City Salzburg – Energy solutions for the future’, which was launched in 2012, also fits into this guideline. 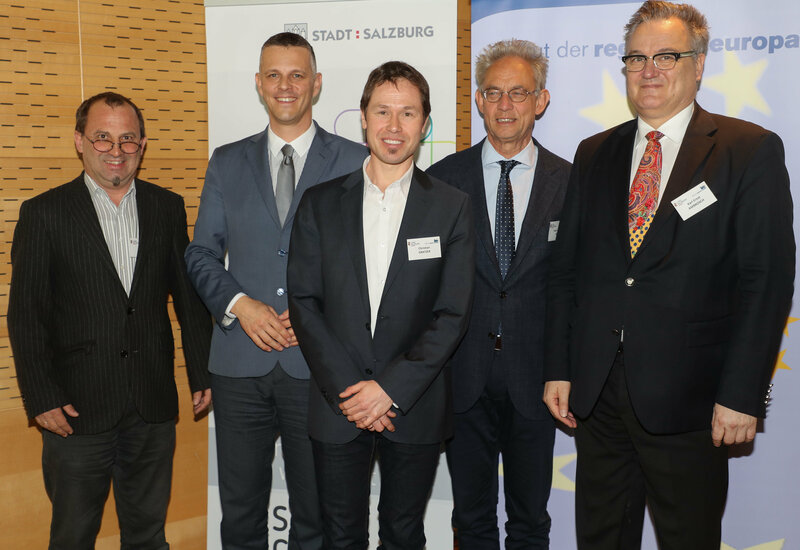 This is an example of the claim of the city of Salzburg, as a provincial capital to take on a pioneering role, when it comes to carefully and actively dealing with their own future”, said Preuner. An optimal connection of the individual traffic with the public traffic as well as the foot and bicycle traffic are the cornerstones of a functioning smart city, which should become a meeting zone. State Councilor (Landesrätin) for Transport, Infrastructure and Housing, Brigitta Pallauf, emphasized at the opening: “We have to think in terms of mobility in a multifaceted and multimodal way. The necessary framework conditions are even better. New technologies support us. The aim of the state mobility concept is to improve the accessibility of all central facilities of the state capital, the district headquarters and the municipalities. Mobility must be possible for all citizens to make the choice between modes of transport easier, and especially in rural areas”. Modern technologies and solutions such as car-sharing, car-pooling and bike-sharing should play a role alongside the main means of transport. In the keynote speeches on “Smart Cites – a political challenge”, the speakers addressed different topics related to a sustainable and green city. The Director of the INZIN Institute, Scientific Director of the Congress IONICA and former Advisor to the German Government on environmental issues, Prof. Martin Faulstich, put climate protection at the center as a crucial framework for mobility. “Climate change will fundamentally change the transport sector. The Paris Agreement on Climate Change has signed virtually by all the countries of the world, giving it a strong global footprint for urban mobility worldwide. A key role is played by electro mobility. Renewable power supply, nationwide charging infrastructure, autonomous driving and networked supply and disposal structures will have a lasting impact on cities and regions”, expressed Faulstich. However, this does not only require an energy turnaround, but also a turnaround in heat and transport. The first step should be traffic avoidance; to achieve this more mobility with less traffic is necessary. The EU member state Slovenia has recognized not only smart cities but also sustainable mobility as two of the key elements of its strategy for smart specialization, which go far beyond the borders of a city. Martin Pečar, Managing Director and Founder of OmniOpti Blockchain Think Tank Slovenia, Coordinator for Smart Cities and Logistics as well as Watify Ambassador explains: “The concepts of smart communities and villages are very important for Slovenia. Another important topic is the exchange of knowledge, cooperation and best practice across regions”. A further best-practice example was presented by Cristian Macedonschi, City Councilor of Braşov/Kronstadt in Romania. He referred to the importance of tourism in Romanian cities, which have “no attractiveness without mobility. One must develop into tourist regions, well networked bicycle paths”. The city council sees the way to mobility through the infrastructure. To provide an environmentally friendly traffic in a functioning urban area, could only work, if the view beyond the cities is given to create intelligent development, followed the former Senate Counsillor of the City of Vienna Otto Schwetz. Better and usable spatial planning as well as developed logistics was in the centre of the podium “Public urban and rural transport concepts in the European context” of the conference. “Each agglomeration has its own structures and challenges. Nevertheless, it is important to find common denominators and learn from best practices. The applicability of the measures reflects the political will, but must also take into account the relative position compared to others and enabling a better choice of strategies for improvement”, commented Karl Ernst Ambrosch, former ERA Chair Holder, in his keynote address. He referred above all to KPIs (Key Performance Indicators), which not only offer very good comparability opportunities, but also “serve as a first step in formulating goals and reporting progress”, he said. As a result, smart technologies and systems support the development of a good quality of life. Using the example of the Green Capital 2017, Essen in Germany, City Director Hans-Jürgen Best referred to smart technologies such as car sharing and bike sharing. “The traffic turn takes place in the head. This does not happen overnight, it does not immediately get into the minds of the people that there are such possibilities”. On the question of the moderator Stefan Veigl, why Essen has rejected Berlin’s offer to free public transport for two years, he answered as follows: “If you want to offer free public transport from one day to the next, then you need rails and buses to be extended for the future”. The regional president (Zupan) of the region of Istria, Valter Flego, agrees with this statement and explained the problem of his city: “5000 to 10,000 people live in the city, of which 70 percent live by the sea. The traffic is conditioned by the weather, when it rains everyone uses the car. The problem is that there is no good bus and train connection”. He sees more EU demands and cohesion policy as a solution. Furthermore, cooperation between the regions of Europe should be henceforth strengthened. Developments in European regions show that urban areas will continue to increase population and jobs in the coming years. More importantly is therefore European cooperation. Christian Gratzer, spokesman of the Austrian Traffic Club/Verkehrsclub Österreich (VCÖ) in Vienna, agreed with the Regional President Flego. “Future mobility and urban freight transport are both emission-free and space-saving. The metropolitan areas require significantly more public transport connections. On the other hand, the potential of the bicycle and the booming electric bicycles is much more to be exploited by setting up direct cycling links from the outskirts to the city”. The commute is the most important reason for mobility during the week and this is exactly where the first step should be. He pointed to the “City toll” as a strategy which should be considered hence it leads to a massive decrease of traffic jams. Subsequently, this would give the city more income, which in turn would be invested in improving mobility. Franz Huemer, Smart City Salzburg Coordinator in Austria added that “the future of urban mobility is perceived as more demand-orientated service. The private vehicle ownership is replaced by a mix of walking, cycling, public transport and additional rental vehicles. New information technologies and systems contribute to promote consumer acceptance and ease of use”. Due to Salzburg’s topographical character, citizens are not only restricted in terms of housing, but also in their mobility. Therefore, according to Hummer, it is necessary to adapt the mobility needs to what is possible in the city. The podium discussion made it clear that modality is not sufficient, but the change of values towards multimodality should be considered as a meaningful offer. The demand for sustainable and integrated solutions for urban mobility is growing. According to Dieter Pejrimovsky, Solution Manager in the regions Europe, Middle East and North Africa at Kapsch TrafficCom Vienna, “Mobility contributes to the quality of life in cities and is not only a prerequisite for economic growth and trade, but also for creativity and well-being”. In his keynote address in the podium “Innovative traffic control systems – best practice examples from Europe”, he said that “the global trend of rapid urbanization is accompanied by rising traffic levels, crowds and air pollution, as well as increasing urban resource and energy consumption”. Kapsch BusinessCom, a Kapsch Group, offers holistic mobility solutions and fully integrated software solutions for the future of interzonal transport. Smart Urban Development is the key to Mega Trends Urbanization. However, in order to “implement the Infrastructure Program, fixed budgets are needed”, Pejrimovsky pointed out. In order to optimize the public traffic flow between cities and regions, there are three starting points for Salzburger Verkehrsverbund Managing Director Allegra Frommer, to be considered. “Firstly, people from the region should get as far as possible into the city and thus to their destination, without having to change. Secondly, it is precisely in regional traffic with half-hourly or hourly intervals for punctuality and reliability. Thirdly, it is about providing the best possible customer information – both analogue and digital – so that passengers are guided quickly, easily and clearly to their public transport offer. Buses and trains will be ideally ‘guided’ into the city”. Furthermore, she referred to practical solutions such as guided private transport, which does not hinder public transport as well as on their own bus lanes and tracks. Subsequently, the free choice of means of transport is in the foreground, followed by coordinated space and traffic planning. Another point that became apparent when talking about traffic and mobility in and around cities is, according to Georg-Friedrich Koppen, Head of the Department of Mobility, Urban Development Planning Department of the City of Munich in Germany, “environmentally friendly traffic efficient parking space management. The basic requirement is attractive public transport. Munich has managed to reduce traffic in the city, although the number of inhabitants has increased”, said Koppen. In order to be able to still cope with the growth in the population in the future, the “associated traffic flows have to be handled in an environmentally sound manner, in particular in the city, thus saving space, low emissions, energy-saving and safe for traffic. This requires an orientation of settlement development towards an efficient and reliable public transport system, complemented by attractive and safe conditions for pedestrians and cyclists”. The unavailable vehicle traffic must therefore be managed in an environmentally sound way, and new possibilities for digitization in transport could make a significant contribution. The development of rapid-transit railways, mobility stations as well as car-sharing and bike-sharing systems sees Koppen as promising, which is already well received and used in Munich. Cities face many challenges such as noise, road safety hazards, congestion, and poor air quality due to growing cities and increased mobilization demand that does not stop at the city border. According to Rainer Müller, Senior Expert for Future Cities at the Urban Innovation Vienna (UIV) in the city of Vienna, lies the solution in the concept of a “productive city” and referred to the project “Vital Nodes” which aims “an efficient and sustainable transport of goods through the TEN-T nodes (urban areas), bringing together existing European, national and regional networks. The project provides evidence-based recommendations for the effective and sustainable integration of the nodes in the TEN-T corridors with a focus on the multi- and inter-zone linkage of long-distance and last-mile freight logistics. In addition, it also supports deployment in urban hubs and at the same time establishes a sustainable network of European experts”, explained the panelist, who presented the city of Vienna as a best practice example of functioning public transport. The capital of Austria is actively involved in the Commission’s EU Framework Strategy. In the neighbouring state Switzerland, however, the mobility problem of the cities is different. It is very often a “utilization problem and the avoidance of shuttle traffic became a new trend”, says Smart City Switzerland’s Project Leader Benjamin Szemkus. “Here it is important to find solutions with suitable simple measures: Carpooling, new ways of working and working hours of consistently promoting slow traffic can achieve a great deal. It is important to involve local people. Prescribed top-down approaches are not the tool of choice”. According to the expert, there are no smart cities but only “smart citizens” who already live a strong environmental awareness in Switzerland on a daily basis. Consequently, the citizens are in the focus. Businesses and Industries are important partner and play an instrument, among other things, to prevent the rural exodus. According to IRE Chairman Schausberger, the rural depopulation is linked to the traffic in the city “This is similar to the refugee problem: you have to start where the people come from”, concluded the Chairman the conference. The main objective of the conference was to bring together the regional partners, to analyze innovative transport programs and technical solutions, and to use best practice examples to stimulate the development of liveable cities. In previous years, the IRE expert conferences took place in cooperation with the cities of Tübingen (DE), Vienna (AT), Wroclaw (PL), Trieste (IT), Ljubljana (SLO) and Banja Luka (BiH).